There are two questions I ask of all companies I might invest in. Do the statistics indicate the business is highly profitable and, if they do, can I identify what makes it special? SharePad can answer the first question, and it can help with the second. Today I’m looking at Harvey Nash because it satisfies the Andrex filter, so-called because I designed it to discover firms with a soft share price, and a strong business, that I can hold for a long time. A reader calculated it eliminates “89.93% of everything out there right off the bat” which, to continue the bathroom analogy, makes it sound more like a Domestos filter. By selecting shares from this sanitised pool, I believe I’m already more likely to pick good long-term investments. Harvey Nash is a recruitment company, specialising in Information Technology, but it also has an offshore division that manages IT, software development, and Human Resource projects for companies from offices in Vietnam. In other words, it can supply businesses with most of their staffing needs, and if they don’t want to employ staff at all, it can do the job for them. This, the company says, means customers need it in good times and bad. In good times, they take on permanent staff, but in bad times they use more temps, which Harvey Nash also supplies, or they ask Harvey Nash to do the work. The filter has four factors. Two, return on capital employed (ROCE) and cash return on capital invested (CROCI) measure profitability. Debt to capital shows us how the business is financed. And the EBIT yield can give us insight into whether the shares are cheap or expensive at the current price. 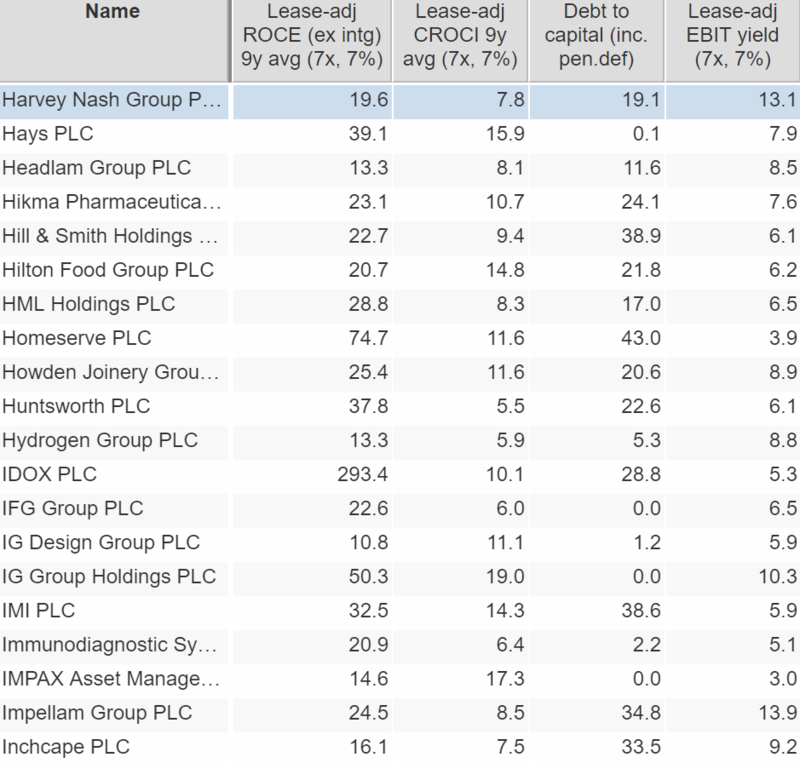 If you compare Harvey Nash to some of the other companies that pass the filter, it doesn’t particularly stand out, although its EBIT yield of 13% is at the top-end of the small selection in my screenshot. The EBIT yield promises high returns if current profits can be sustained or improved. It suggests the shares might be cheap. Maybe Harvey Nash is more noteworthy because it’s cheap than because it’s good. That notion is reinforced by its profitability in cash terms (Cash Return on Capital Invested), which at 8% is mediocre. First, profitability. I’ve pulled the scale back to the beginning of the millennium for this chart. 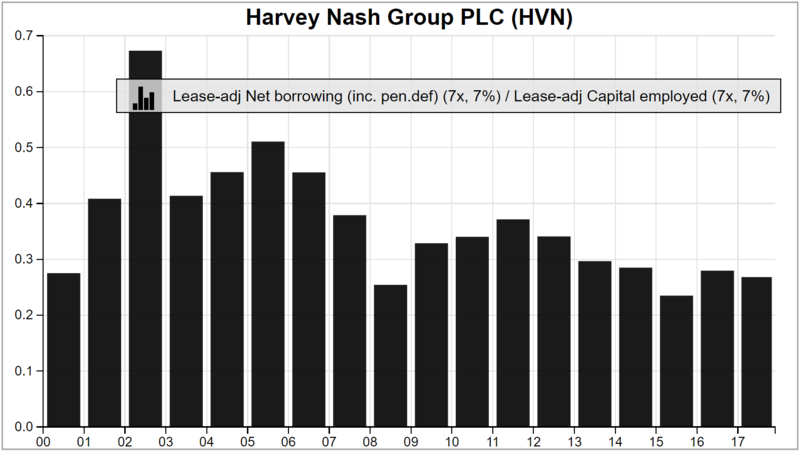 Despite its mix of permanent and contract work, Harvey Nash is a bit of a boom-bust stock. As you might expect for a company in IT, profitability soared during the technology bubble. It soared right off the scale. Profitability also ballooned in the years before the financial crisis of 2008. While there was no broad technology bubble then, credit was easy and banking was booming. It’s probably fair to assume the banksters were using a lot of IT staff. Next, debt. The default debt to capital ratio used by SharePad measures total debt, without deducting cash, and it doesn’t account for operating leases, an alternative method of funding assets that is a kind of hidden debt. Here I’ve created my own debt to capital ratio using SharePad’s ‘combine items’ facility, by dividing lease-adjusted capital employed into lease-adjusted net borrowing. From now on I will be using this measure in the filter too. Broadly speaking I get nervy if a company is more than half funded by debt and hidden debt. Since the financial crisis, Harvey Nash has consistently maintained this ratio at less than 30%. 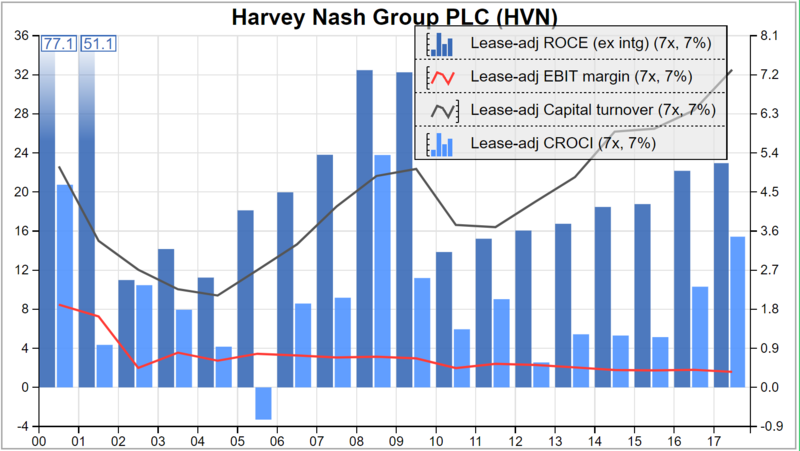 Harvey Nash passes the filter, and my temporal test (with a few reservations about cash flow). But it’s a recruitment company and I find it very hard to distinguish one recruiter from another. In other words, I wonder what makes Harvey Nash special? Many recruiters have similar business models. They pay fee earners (recruitment consultants) very well so they don’t split and work for a rival, taking the firm’s business with them. They iron out, with limited success, the boom bust cycle by shifting the balance between contract and permanent staff. Harvey Nash admits recruitment is a competitive market, and it’s getting more competitive. It faces new competition from software companies and social media sites. On top of that, the commodity recruiters trade, people, are less valuable because we’re easier to replace with computer power and cheaper freelance and foreign labour. You may wonder why, with this jaundiced view, I bothered to investigate a recruiter in the first place. Well, our prejudices often mislead us, so I hoped to find out I was wrong. Best of a good bunch? Harvey Nash’s annual report addresses the risks, briefly. Brands make it special. Good client relationships will prevail over the online threat. It will prosper during the rise of the robots as companies take on more technicians and software developers to put the rest of us out of a job (I paraphrase, obviously). These attributes could lead to outsized profits in future, but Harvey Nash’s annual report gives me little reason to believe it will be any better at resisting the challenges facing the industry than rivals. To grow, the company needs more recruiters and more clients. It can get both quickly by buying other recruitment consultancies, something it’s done in the past. Following a strategic review announced in April, Harvey Nash has acquired two firms and relisted on the Alternative Investment Market, where lighter regulation makes it easier to buy other companies. Acquisitions are a cost that can dampen the returns shareholders earn, if the acquirer pays too much. But the return on capital calculation I use ignores the cost of acquisitions because they happened in the past (In SharePad I exclude intangible assets in the ROCE calculation, because they are often created when one company acquires another). I’m interested in the profitability of the businesses I see in front of me today. Following the strategic review, acquisitions are a more important part of Harvey Nash’s strategy, so we must decide whether they generate sufficient returns. SharePad’s default measure of ROCE includes some of the cost of acquired intangible assets, but it ignores those the company has amortised or written-off. We can work out the full cost by adding amortisation of acquired intangible assets to profit and dividing the result by capital employed, calculated using the original cost of the acquisitions. Finding this information requires a bit of digging in the notes to the company’s accounts, but it can be revealing. Harvey Nash’s Return on Total Invested Capital (ROTIC) in 2017 was fractionally below 10%. On this basis, it would just fail my filter. It’s not a bad business by any means, but I don’t believe it’s one of the best of a good bunch.